Ready, Set, Slip and Slide! 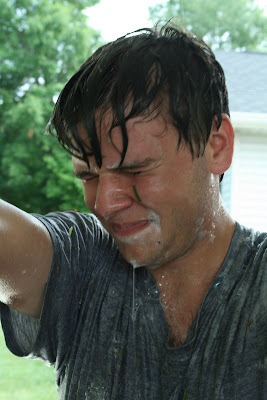 One of the kids thought it would be fun to get a Slip 'n Slide for the graduation barbecue. Sounded good to me. I hadn't even seen one in years. 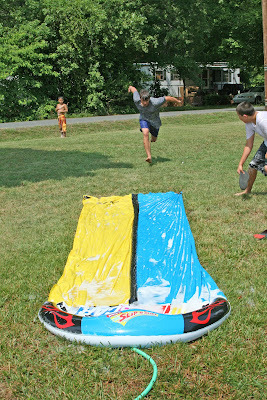 They didn't have the old Slip and Slides at Wal-Mart, so we ended up with a deluxe double lane Slip 'n Slide with a NASCAR theme. That seems somehow quite fitting, since we live in NASCAR country. 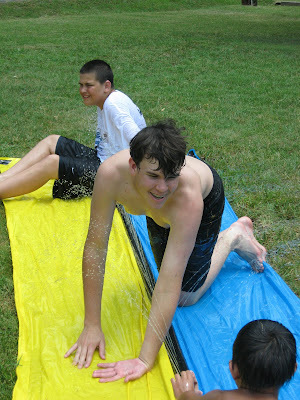 All the boys loved the Slip 'n Slide. Not sure the girls tried it out. It got pretty messy. My kid decided he could slide faster if soaped up. He got the dish washing liquid from the kitchen. 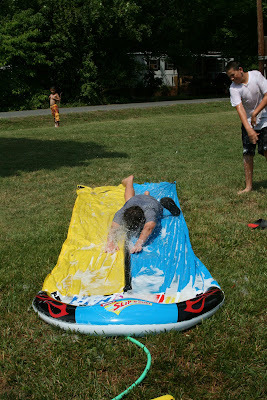 First, the boys poured that on the Slip and Slide lanes. Then they began to pour it on their clothes too before taking a run and sliding at top speed. I thought about taking a slide, but I decided it wouldn't be much fun grilling in wet and sudsy clothes. Hum. Maybe another day. It definately looked like fun.